PART 4 – Catherine Solyom did not challenge Hussein Hamdani when he said that "Islamicization meant something different in the pre-9/11 world"
In their May 27, 2015 paper editions, the National Post, the Montreal Gazette and other Postmedia newspapers published on their front page an article by Catherine Solyom defending Hussein Hamdani, an advisor to Public Safety Canada who was suspended on April 29, 2015 after the Quebec-based TVA news network had considered of public interest to report some of his links with terror-funding organizations. On April 29, Point de Bascule had also published a report about Hussein Hamdani's activities. Ms. Solyom did not comment on most of Hussein Hamdani's past positions that were presented by Point de Bascule as incompatible with his role as security advisor to the Government of Canada and she presented him as a victim. When she did tackle some of Hussein Hamdani's past positions, she simply reported what Mr. Hamdani's thoughts were on the subject without comparing his answers to what is easily accessible on these matters in the public domain. Her piece was the exact opposite of what investigative journalism should be. In the process, Ms. Solyom presented as a non-issue a meeting that was organized by Hussein Hamdani's Ihya Foundation and sponsored by the terror-funding Saudi World Assembly of Muslim Youth in January 2003 since it was supposedly the same event that had been listed since 2005 in Hussein Hamdani's bio on the Public Safety Canada's website / WebArchive – Archive.Today. In fact, the Toronto Muslim Summit that is mentioned in Mr. Hamdani's official bio is an entirely different event that took place in September 2003. Three days after Catherine Solyom's article was published, the Toronto Star / Archive.Today and La Presse (Montreal) / Archive.Today reported that family members of youth trying to reach jihad in Syria had told national security investigators that their young relatives had "received precise travel instructions, financing advice and moral support" at the mosque run by the man with whom Siegfried Mathelet had been collaborating. Catherine Solyom did not mention the connection between Adil Charkaoui and the researcher she was quoting in her article that aimed at convincing her readers that Hussein Hamdani's collaboration with terror-funding organizations should not be questioned. As we publish this article, Hussein Hamdani's bio is still available on the Public Safety Canada website. Hussein Hamdani's collaborations with three terror-funding organizations whose charitable status was revoked by the Canada Revenue Agency, and with a fourth one that has endorsed Hamas after it was listed as a terrorist organization by the Government of Canada in 2002, were first mentioned in an article that was published by Point de Bascule on October 4, 2014, on the occasion of a visit by Mr. Hamdani and other members of a Public Safety Canada delegation to Maryland to meet a police chief. Hussein Hamdani was aware that Point de Bascule had dedicated a file to his past activities. "It was almost a badge of honour," Hussein Hamdani told Catherine Solyom. 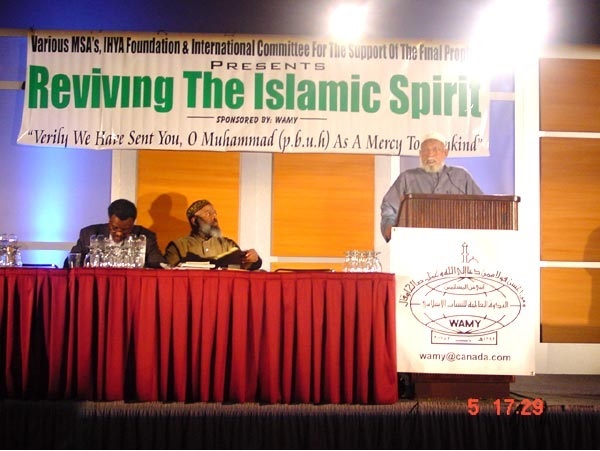 ISNA-Canada – On October 6, 2013, while Hussein Hamdani was Vice-Chair of the North American Spiritual Revival, his organization invited Siraj Wahhaj to speak at the Islamic Society of North America Canada's (ISNA) mosque in Mississauga. This event took place two weeks AFTER the charitable status of an ISNA substructure (ISNA-Development) had been revoked by the Canada Revenue Agency because the Islamist organization provided tax receipts to a second entity that transferred funds to a third entity whose armed wing wages jihad in India. World Assembly of Muslim Youth – In January 2003, Hussein Hamdani was a director of the Ihya Foundation when it launched the Reviving the Islamic Spirit conventions in Toronto with the sponsorship of the Saudi World Assembly of Muslim Youth (WAMY). This organization has been fingered for years for financing terrorism. In 2012, when the Canada Revenue Agency revoked WAMY's charitable status, it highlighted that its Canadian branch funded an Al Qaeda-linked organization in 2001, two years before it sponsored the launch of the RIS conventions. IRFAN-Canada – In spite of being a security advisor to Public Safety Canada, Hussein Hamdani maintained his leadership positions with the Halton Islamic Association and the Hamdani Foundation, two organizations that contributed to IRFAN-Canada, a Hamas's fund collector, between 2005 and 2009. There were many warnings that IRFAN-Canada was contributing to Hamas. Among them, one came in 2004 from then Opposition MP Stockwell Day in the House of Commons. Another one came from the United States. In 2007, the U.S. Holy Land Foundation terror trial (subsection VIII) revealed that IRFAN was a part of Hamas's global financing mechanism. In April 2011, the Canada Revenue Agency revoked IRFAN's charitable status after having concluded that, for the 2005-2009 period alone, it transferred $14.6 million to the terrorist organization Hamas. In April 2014, IRFAN was added to Canada's list of outlawed terrorist groups. In her defence of Hussein Hamdani, Ms. Solyom wrote that "The federal government knew about [...] his [Hussein Hamdani's] role in organizing a World Muslim Summit in Toronto in 2003, another point raised by Point de Bascule as evidence of his radical nature (and listed on his roundtable bio)." Ms. Solyom failed to correctly identify the meeting that is mentioned in Hussein Hamdani's bio on the Public Safety Canada's website / WebArchive – Archive.Today. The Toronto Muslim Summit that is mentioned in Hamdani's roundtable bio was held in September 2003, according to an article written by Hussein Hamdani himself that is available on the Muslim Presence's website / WebArchive – Archive.Today. Adding to the confusion, Ms. Solyom invented a new name for the event. She called it the "World Muslim Summit." The event to which Point de Bascule referred in its April report is the Reviving the Islamic Spirit convention / Archive.Today. It was also organized by the Ihya Foundation in Toronto, but it took place on January 4-5, 2003. This convention was sponsored by the Saudi World Assembly of Muslim Youth (WAMY), an organization whose Canadian branch's charitable status was revoked by the Canada Revenue Agency / Archive.Today in 2012 because it funded an entity linked to Al Qaeda. This first edition of the Reviving the Islamic Spirit (RIS) convention was, in fact, the second edition of an event that had been organized the year before in London UK by the Saudi International Committee for Support of the Final Prophet (ICSFP). In 2003, the ICSFP joined with Hussein Hamdani's Ihya Foundation to organize its second convention in Toronto under the theme Reviving the Islamic Spirit. National Post: [EXCERPT] A Muslim youth organization that American counter-terrorism officials say was founded by Osama bin Laden's nephew has been operating in the Toronto area, the National Post has learned. The Canadian branch, in Mississauga, operates under the supervision of the U.S. wing set up by Abdullah bin Laden, according to the group's own literature. Its headquarters is in Saudi Arabia. [...] "The Jews are the enemies of the faithful, God and the angels," Special Agent Kane quoted another WAMY book, entitled A Handy Encyclopedia of Contemporary Religions and Sects, as saying. "The Jews are humanity's enemies; they foment immorality in this world; The Jews are deceitful, they say something but mean the exact opposite." [...] Special Agent Kane quoted from a publication prepared by the Camps and Conferences Unit of WAMY that said: "Hail! Hail! O Sacrificing Soldiers! To Us! To Us! So we may defend the flag on this Day of Jihad, are you miserly with your blood?! And has life become dearer to you? And staying behind sweeter?" Many speakers, who were invited by Hussein Hamdani's Ihya Foundation to address the RIS 2003 convention, are involved in this type of pre-violent radicalization. This was the object of a previous article by Point de Bascule. During a case heard by Canada's Immigration and Refugee Board in 2003, WAMY was described as an organization that provided a "generous financial assistance" to the terrorist Students Islamic Movement of India, whose goal was stated as being "Jehad against India, the aim of which is to establish Dar-ul-Islam (land of Islam) by either forcefully converting everyone to Islam or by violence." NOTE: The Canada Revenue Agency audited WAMY-Canada before revoking its charitable status in 2012 for its funding of a terrorist entity. The Agency's audit report / GlobalPhilanthropy.ca contains a substantial amount of information that helps better understand the real purpose of WAMY and so many of these Islamist fronts. This photo of RIS 2003 and others clearly identify the Saudi WAMY as a sponsor of the event on the banner and on the lectern. Hussein Hamdani's Ihya Foundation is also identified as one of RIS 2003's organizers on the banner. 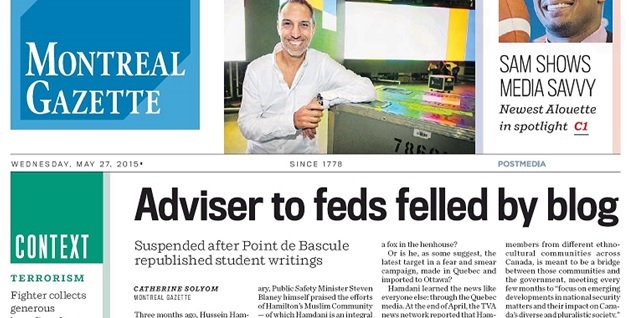 The April 2015 Point de Bascule report published before Hussein Hamdani's suspension by Public Safety Canada also mentioned that, in the 1990s, Mr. Hamdani wrote a text entitled The Islamicization of campus politics and the politicization of the MSA that was published in 1996 by MSA National, the leading entity of the Washington-based Muslim Students' Association. According to what Ms. Solyom reported, Hussein Hamdani told her that "Islamicization meant something different in the pre-9/11 world." In a video that was added to the online Montreal Gazette version of Catherine Solyom's article, Hussein Hamdani said that "[In 1994], the term 'Islamicization' meant [for Muslims] to use their own moral framework to govern how they're gonna vote on issues. I know in... now, in year 2015, whenever you use the word Islam or Islamicization, it's got all kinds of negative connotations... Some type of secret attempt to bring sharia law into Canada. That's not what was intended in 1994 when I wrote the article." There is a discrepancy when we compare what Hussein Hamdani is saying in 2015 with what he wrote in the 1990s. In his text of the 1990s, Hussein Hamdani's ambitions were not limited to ask Muslim students to vote according to Islamic principles, but to influence the life of all students on campus in conformity with Islamic principles. Hussein Hamdani in the 1996 MSA guide: "First, it should be the long-term goal of every MSA to Islamicize the politics of their respective university. In other words, consciously or unconsciously, the daily life on campus of every student [highlighted by Point de Bascule] must try to conform to the Islamic ideal." Catherine Solyom did not report that Hussein Hamdani's goal to Islamicize campus politics also led him to advocate for Muslim control of student unions, and particularly of their substructures allocating financial resources. Hussein Hamdani in the 1996 MSA guide: "At McMaster, all the funds that are allocated to each club is handled by only one person, the club administrator. Other universities may have the same system, concentration of authority in one person, or in a committee. Nevertheless, it is imperative that Muslims get on these committees and occupy positions. No one single university institution can help the MSA more than the one that allocates the funding. The 1993-1994 McMaster clubs administrator was a Muslim and he basically gave the MSA a blank cheque [highlighted by Point de Bascule]. He greatly helped his ummah [Muslim community]." [...] "The MSA should form a new club with a different name, under the MSA's umbrella with the sole purpose of getting funds from the university to establish a newspaper." [...] "Aim is to rise within the ranks of the [Student] Union and to get on selected executive committees. I cannot stress this enough, the Union has vast powers that Muslims need to control. This is where the real politics lies." Hussein Hamdani's latest theory that the meaning of the term 'Islamicization' (or its equivalent 'Islamization') suddenly changed after 9/11 is groundless. When, in the 1980s and the 1990s, the media reported on the campaigns of Islamization (Islamicization) that were going on in Zia-ul-Haq's Pakistan (New York Times 1988 / Archive.Today) and in Sudan (New York Times 1992 / Archive.Today), they meant one thing: sharia rules were being implemented. Jaafar Idris, who was invited to speak at the first Reviving the Islamic Spirit convention that was organized by Hussein Hamdani's Ihya Foundation in 2003, also provided a definition of the term 'Islamization' before 9/11. He did so in 1975 when he gave a lecture entitled The process of Islamization / Archive.Today at an MSA convention in Toledo (Ohio). His definition of the concept is identical to how it is being understood today. In Idris' pre-9/11 speech, 'Islamization' meant progressive implementation of Islamic law, progressive implementation of sharia. Jaafar Idris / Part 1: "The aim of the Islamic movement is to bring about somewhere in the world a new society wholeheartedly committed to the teachings of Islam in their totality and striving to abide by those teachings in its government, political, economic and social organizations, its relation with other states, its educational system and moral values and all other aspects of its way of life." Our organized and gradual effort which shall culminate in the realization of that society is the process of Islamization." Jaafar Idris / Part 8: "If our ultimate aim is to form a community of our own, then the embryo of that [Islamic] community has to be formed in the womb of the community that we desire to change. Only in this way can we face the challenges of the community to which we are opposed." Hussein Hamdani's call for Muslim control of student unions and their substructures allocating financial resources was not published by some obscure, fringe organization, but by Washington-based MSA National, the leading entity of the Muslim Students' Association of the U.S. & Canada. Ms. Solyom did not provide any historical information about the MSA that could have helped her readers understand the context of Hussein Hamdani's call to Muslim student activists. The MSA was established in 1963 by various Muslim Brotherhood activists who had come to study in North America. In 1991, five years before the publication of Hussein Hamdani's recommendations, a Muslim Brotherhood internal memorandum presented the MSA as one of the organizations belonging to the Brotherhood network in North America. MB memorandum / Point 4 – The Ikhwan [Muslim Brotherhood] must understand that their work in America is a kind of grand Jihad in eliminating and destroying the Western civilization from within and "sabotaging" its miserable house by their hands and the hands of the believers so that it is eliminated and God's religion is made victorious over all other religions [...] It is a Muslim's destiny to perform Jihad and work wherever he is and wherever he lands until the final hour comes. "It was a dream, because that's what you're conditioned to do–to really love the Ikhwan," Saied says, using the Arabic term for Brothers or Brotherhood. "They're very smart. Everyone else is gullible," Saied says. "If the Brotherhood puts up somebody for an election, Muslims would vote for him not knowing he was with the Brotherhood." In 2007, an NYPD report (page 68) described MSAs as "incubators" for radicalism. After relaying Hussein Hamdani's message in the first part of her article, Ms. Solyom dedicated the second part of her article to tarnishing the reputation of Point de Bascule, and of its director Marc Lebuis. To do so, she contacted Siegfried Mathelet, a post-doctoral researcher at a UNESCO Chair at the Université du Québec à Montréal / WebArchive – Archive.Today. Siegfried Mathelet: "His [Point de Bascule director Marc Lebuis'] modus operandi, like that of numerous anti-Islam bloggers and organizations based in the U.S. [...] is to take anything problematic associated with Islam — like the Boko Haram or ISIS attacks — and link them to people in Quebec and Canada." In this case again, Ms. Solyom did not do the most basic verification on Point de Bascule's website to assess the claim of her interviewee. If she had done so, she would have noticed that, for many years now, Point de Bascule's coverage of foreign Islamist organizations is almost non-existent. In fact, it's one of our weaknesses. This approach led us to translate the Muslim Brotherhood founder's 50-point Manifesto in French five years ago. Although Hassan Al-Banna was an Egyptian who died many decades ago without ever visiting Canada, we thought that his ideas had to be easily accessible since important Islamist actors like the Muslim Association of Canada and Jamal Badawi endorse him and promote him in Canada. Contrary to Mr. Mathelet's assertion, Point de Bascule's approach is not to presume of what the intentions of local Islamists are simply by looking at what is going on abroad. Our approach is to study what local Islamists are saying and publishing, which scholars and which sharia manuals they are endorsing before drawing our conclusions on the facet of the program that they are applying at a given time. Catherine Solyom did not inform her readers that Siegfried Mathelet, the person whom she relied on to tarnish Point de Bascule and its director, has been collaborating with Islamist Adil Charkaoui at least since 2013. They were both identified as contact persons for the Collectif québécois contre l'islamophobie (CQCI) in February 2014 / WebArchive – Archive.Today. They co-signed an article in December 2013 / WebArchive – Archive.Today, they both spoke at a CQCI event in January 2015 / WebArchive – Archive.Today, etc. Then, he agreed that Mohamed Rifaat had been photographed beside him during activities organized by his Centre communautaire islamique de l'Est, as reported by La Presse (Montreal). [...] Three of Imad Eddine Rafai's neighbors in the Villeray district said that they saw the Islamist activist [Charkaoui] entering and exiting the building on many occasions between July and December 2014. On March 14, 2015, Catherine Solyom's expert, Siegfried Mathelet, and two other persons defended Adil Charkaoui in the Huffington Post / WebArchive – Archive.Today without identifying him by name, but by describing him as "a teacher and a Montreal-based preacher [whose] 'students' [...] presumably left for jihad in Syria" («un enseignant et prédicateur musulman de Montréal [dont] 'ses élèves' [sont] partis présumément faire le djihad en Syrie». On May 22, 2015, four days before Catherine Solyom's hit piece against Point de Bascule was published, the National Post / Archive.Today and other Postmedia newspapers reported that, according to Canadian government's documents, "The RCMP observed Charkaoui carrying out a theft and fraudulent credit card purchases in 2000 [...] and CSIS believed the proceeds were used to fund an overseas jihadist group." In spite of all these troubling elements of information, Ms Solyom resorted to Charkaoui's collaborator, Siegfried Mathelet, to denigrate Point de Bascule. More importantly, she did not mention in her article the connection between her expert Mathelet and Adil Charkaoui. On May 30, three days after Catherine Solyom's article was published across Canada, the Toronto Star / Archive.Today and La Presse (Montreal) / Archive.Today reported that family members of youth trying to reach jihad in Syria had told national security investigators that their young relatives had "received precise travel instructions, financing advice and moral support" at the Montreal mosque run by Adil Charkaoui. Adil Charkaoui (center) and Siegfried Mathelet (right) at a meeting organized by the Collectif Québécois contre l'islamophobie (CQCI) in January 2015. Both Charkaoui and Mathelet were identified as CQCI's contact persons in February 2014. Ms. Solyom wrote that Public Safety Minister Steven Blaney made the following statement after IRFAN-Canada lost its charitable status in 2011: "The well-intentioned and charitable Canadians who sought to support humanitarian relief through this organization deserve better." In fact, Minister Blaney made the statement in 2014 after IRFAN was listed a terrorist entity by the Government of Canada. It was reported on the National Post's website / Archive.Today at the time. The original 2014 press release that was issued by Public Safety Canada is also available on the Department's website / WebArchive – Archive.Today. In her article, Catherine Solyom wrote that "It [Point de Bascule] placed particular emphasis on Hamdani's writings as treasurer of the Muslim Students Association at McMaster University in 1996, where he called for the 'islamicization' of campus politics." In the video of the interview that Hussein Hamdani granted to the Montreal Gazette (and likely to Ms. Solyom herself), Mr. Hamdani said that he wrote his text in 1994, not in 1996, contrary to what Ms. Solyom claimed in her article. Moreover, Hussein Hamdani graduated from McMaster in 1995, as indicated in his LinkedIn profile / Archive.Today. Therefore, it is very unlikely that Hussein Hamdani was the MSA treasurer at McMaster in 1996, contrary to Ms. Solyom's assertion. As far as Hussein Hamdani's text on the Islamicization of campus politics is concerned, the only thing that occurred in 1996 that we can think of was the publication of the MSA guide that included Hamdani's text. In the longer version of her article published by the Montreal Gazette / WebArchive – Archive.Today, Ms. Solyom stated that "Point de Bascule's story on Hamdani appeared on [Pamela] Geller's website as well as that of Steve Emerson's Investigative Project on Terrorism, where it appeared under the heading Hamas-loving Canadian Islamist Baffled by Suspension. Both the Geller and Emerson postings were then re-posted on Point de Bascule." It is true that Pamela Geller reproduced Point de Bascule's article about Hussein Hamdani's call to Islamicize student politics. But Point de Bascule did not re-post Ms. Geller's article. What would be the point of re-posting our own articles after they are republished elsewhere? As for the Investigative Project on Terrorism (IPT), they did cover the Hamdani affair but they did not reproduce the Point de Bascule article. They came up with their own article that was centered on a facet of Hussein Hamdani's past that was unknown to Point de Bascule when we presented our April report before his suspension. IPT's article commented on Hussein Hamdani's self-confessed "passion for Hamas," and Hamdani's recollection of his meeting with the founder of Hamas as it appeared in 2004 in the UK-based Islamist Q-News magazine. IPT highlighted that "One year after openly embracing a jihadist movement in writing, Hamdani was named to a Canadian national security roundtable, where he continued to serve until being suspended April 29 pending an investigation." Point de Bascule did reproduce a short excerpt of IPT's article and encouraged its visitors to read the full article on IPT's website. Hamas was added to the list of outlawed terrorist entities by the Canadian government in 2002. Aside from being engaged in the destruction of Israel (Hamas charter / article 13), Hamas' leaders have frequently advocated an Islamic conquest of the West (2006 – 2008 – 2011 – 2012). In 2011, for example, Hamas leader Mahmoud Al-Zahhar said on TV that Western civilization "will not be able to withstand the great and glorious Islam." On July 16, 2013, Hamas threatened to launch terrorist attacks in countries where Israel's embassies are located. Canada is among the potential targets, of course. "I've probably done more than anyone else in Canada [to prevent radicalization]," Hamdani says. "And because we're exposed to certain information that's not public and we work with the RCMP and CSIS, I have security clearance and my background has been vetted. There are no links to anything of concern." If Hussein Hamdani has indeed been vetted, what does it tell us? That all of Hussein Hamdani's activities with terror-funding organizations should not be questioned, or that there is a serious problem with the vetting process itself?